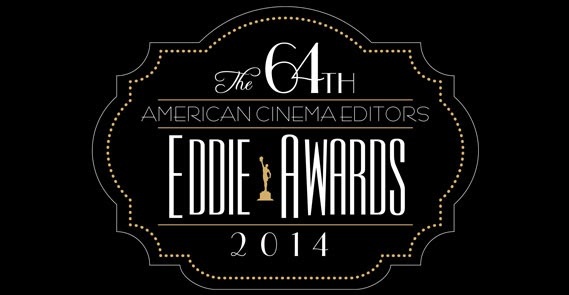 The American Cinema Editors have announced the nominations for the 64th annual ACE Eddie Awards. The nominees for Best Edited Feature film includes the editors for 12 Years a Slave, Gravity, Her, American Hustle, Inside Llewyn Davis and the controversial The Wolf of Wall Street. Each of the nominees for Comedy or Musical could easily have been included in Drama, while Her and Saving Mr. Banks could just as easily been in the comedy category. In the television section, the show Breaking Bad picked up four nominations, including three for Skip MacDonald. The winners for the 64th Annual ACE Eddie Awards will be announced at the ceremony on February 7 at the Beverly Hilton. The Wolf of Wall Street, Thelma Schoonmaker, A.C.E. Despicable Me 2, Gregory Perler, A.C.E. 30 Rock: “Hogcock! / Last Lunch”, Meg Reticker / Ken Eluto, A.C.E. Breaking Bad: “Felina”, Skip MacDonald A.C.E. Breaking Bad: “Ozymandias”, Skip MacDonald A.C.E. The Good Wife: “Hitting the Fan”, Scott Vickrey, A.C.E. Homeland: “Big Man in Tehran”, Terry Kelley, A.C.E. House of Cards: “Chapter 1”, Kirk Baxter, A.C.E. American Horror Story: Asylum: “The Name Game”, Stewart Schill, A.C.E. Phil Spector, Barbara Tulliver, A.C.E.